In Mexico's Elections, Women Are Running In Unprecedented Numbers Elections are Sunday, and more than 3,000 women are running for office. "We women will continue to work three times as hard as men," says one candidate. 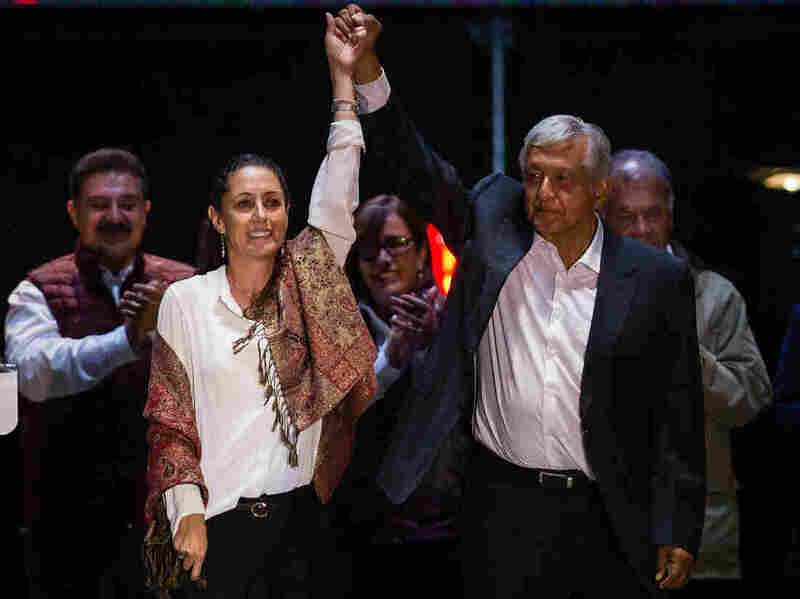 Claudia Sheinbaum, the leading candidate for mayor of Mexico City and Andres Manuel Lopez Obrador, the frontrunner for president, attend the final event of the 2018 campaign in Mexico City on Wednesday. "Just because I might look like a skinny scientist doesn't mean I'm not going to crack down on crime here. I will," she told a crowd recently. In the race for the next mayor of Mexico City, five of the seven candidates are women. One of them, Claudia Sheinbaum, leads in the polls by as much as 20 points. She's running on the Morena or National Regeneration Movement ticket. The party's presidential hopeful Andrés Manuel López Obrador is favored to win, too. Sheinbaum holds degrees in physics and energy science and recently served as a council member in one of Mexico City's largest neighborhoods. "Just because I might look like a skinny scientist doesn't mean I'm not going to crack down on crime here. I will," she tells an enthusiastic crowd at a park near downtown Mexico City. Sheinbaum supporter Zoyla Zamudio, 86, says she's thrilled so many women are getting into politics and breaking old stereotypes. "We are no longer just housewives who stay at home and wash and iron," says Zamudio. "Sheinbaum is a very qualified woman. She knows a lot of things." And, she says with a chuckle, "I'm sure she knows how to wash and iron, too." Breaking into Mexico's male-dominated political system has not been easy. Mexican women were late in getting the vote — it came in 1953, more than 30 years after U.S. suffrage. The only woman to qualify for this year's presidential ballot dropped out last month, due to low poll numbers. And fewer than a fifth of the country's mayors are women. But Dania Ravel Cuevas of the National Electoral Institute says this election may break some of those glass ceilings. "We have an unprecedented number of women competing," she says. That's thanks to a four-year-old law requiring each political party to make sure half of all their candidates are female. Political scientist Ivonne Acuña Murillo of the Iberoamericana University says the law is already working: More than 40 percent of the lower house of Congress is now female. But she says resistance to the gender parity law remains fierce. A common complaint she hears from candidates and party officials is that it's hard to find qualified women to run for office. "The same can be said for the male candidates and even those already occupying offices," she points out. "Many parties scoff at the law, too," she says. "On paper, they comply, but then put women in races they can't win. They don't provide equal resources and in some cases, have forced a female winner to resign so a man can take the seat." "Once the law passed," she says, "everyone was frantically looking around asking, 'Where are all the women?' "
She says some men don't take her ideas seriously. And she can't be seen as too aggressive and risk being labeled as trouble. "So for now, in my Mexican system," she says, "we women will continue to work three times as hard as men." A previous Web version of this story used incorrect Spanish for the phrase "the year of the woman." The correct phrase is "el año de la mujer."